Elegantly furnished luxury villa situated amongst 165 acres of tranquil nature reserves with natural lakes minutes away in Davenport. Private pool and within driving distance to attractions. The villa is in Bridgewater Crossing, a beautiful community that nestles among 165 acres of tranquil nature reserves. Natural lakes are a matter of minutes away. There is a 3 mile lake front nature trail, and various community facilities including tennis courts, volleyball court and basketball court to mention a few. There is also, facilities for children including a play area and swimming pool. The community facilities are well maintained and are free to use for the renters of our property. Our availability calender is updated every time we receive a booking. We offer instant confirmation and are happy to answer any questions you may have as renters. The main priority is for our renters to enjoy their holiday. Bridgewater Crossing is located 5 minutes away from Juntion 58 on the Interstate 4, 1 junction down from Disney and Celebration. It is a quiet, peaceful established community built in a conservation area. The Champions Gate golf club and shopping complex is a 5 minute drive away, and offers an award winning golf course. Facilties include supermarket, McDonald's, video store, beauty parlour and dry cleaners. 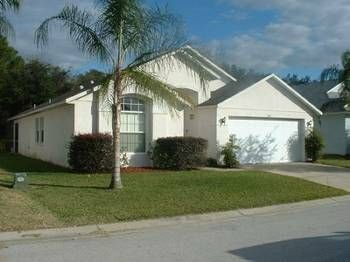 A further 10 minutes away is Kissimmee and the 192 with all its shops and attractions. Conservation woodland at the rear. The villa is elegantly furnished in an attractive modern style and is fully air conditoned. The villa includes a playstation 2 for fun and games for all the family. Everything required for a perfect holiday is provided.